A week ago today Mars Express flew past Phobos for its closest encounter yet, and it snapped some gorgeous views onto the trailing hemisphere of the moon. I don't have time right now to say much more, but here's a photo, which I've rotated so that north is up. Although the photo does technically cover the terrain in which the Russian Phobos sample return mission Phobos-Grunt will eventually land, the potential landing site is actually in shadow in this view, and there are no details to be brought out by stretching the contrast. Mars Express approached to within 93 kilometers of Phobos to snap this photo, on July 23, 2008. This image has been rotated so that north is up. It was summer at Mars, so the north pole is well-lit in this photo. 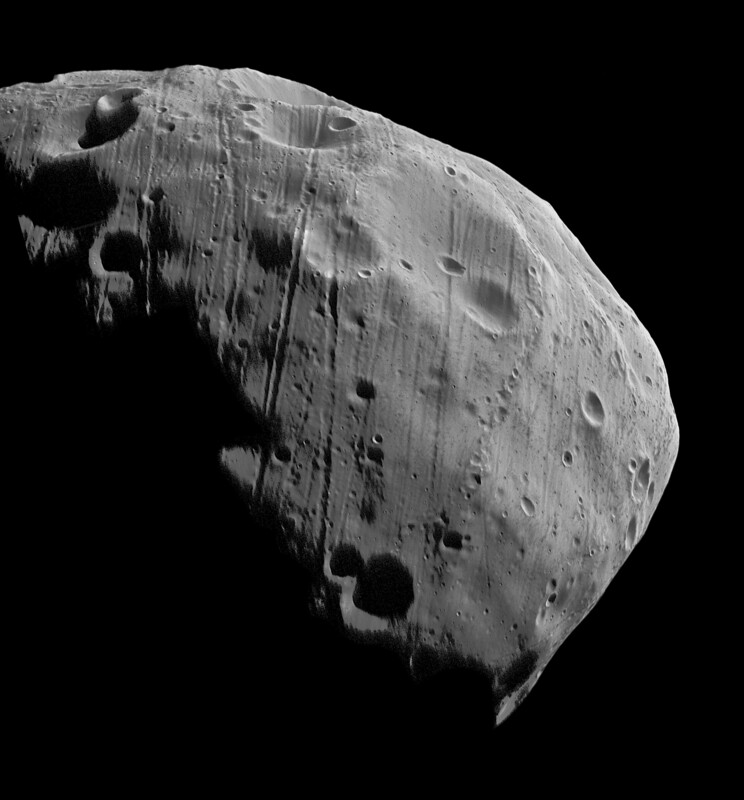 The view is centered about 40 degrees north on the trailing hemisphere of Phobos, which has not been seen at very high resolution in the past, although much of the trailing hemisphere terrain is lost in nighttime shadow. The double crater located near the terminator is about 30 degrees north and 20 degrees east of the center of the trailing hemisphere.